What came first, the chicken or the egg? People have been asking it for a while. Even Aristotle wondered about it. It was a philosophical questions meant to stimulate thought on the origin of life, and Earth, and the universe. Here’s the thing, we kind of know all that now. Darwin, Newton, Einstein, etc, we kind of get how it all works. Evolution is the key here. At the beginning of time there was neither chicken or egg. Now there is both. At a certain point in the history of the universe each of those things came into existence. Because they did not exist forever, and they do now, they must have come into existence, with the first of it’s kind. But which of these firsts came first? noun: the roundish reproductive body produced by the female of certain animals, as birds and most reptiles, consisting of an ovum and its envelope of albumen, jelly, membranes, egg case, or shell, according to species. If by egg we mean the thing above then the answer is definitely egg. Duh. Egg laying animals existed before chickens. Therefore eggs existed before chickens. Dinosaurs and prehistoric fish laid eggs and they were not living with chickens. But that can’t be what is meant by the question. Something so easy to answer would not have puzzled so many for so long. Therefore just any old egg can’t be what is meant. A specific type of egg. The most obvious answer is the chicken egg. Since the other part of the riddle is a chicken, a chicken makes sense. What came first a chicken or a seahorse egg? As far as questions go seems kind of random. You get the point. Let’s take a second to talk about what a chicken is. Take anything on a farm that we call a chicken, and look at it’s DNA. That’s a chicken. So here we have our clarified question. 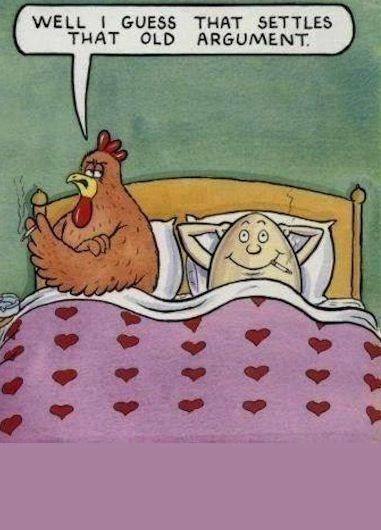 What came first, the chicken or the chicken egg? Well, again, that just serves to clarify further, rather than answer, the question on which the original question depends. What do we mean by chicken egg? What defines a chicken egg? Is it the fact that it contains a chicken or the fact that a chicken laid it? Along the course of history, at some point, some animal that was not exactly genetically a chicken gave birth to some mutated version of itself that had the exact DNA of what is a chicken. Consider this moment and ask again what is a chicken egg. If a chicken egg is an egg that contains a chicken, then the egg came first. The non-chicken laid an egg containing the DNA of what would eventually become the chicken. The egg came first therefore, the first egg, and the chicken that hatched from it was the first chicken. The egg preceded the chicken. On the other hand, if a chicken egg is an egg that is laid by a chicken, then the chicken came first. The non-chicken laid an egg containing the DNA of what would eventually become the chicken. The egg is therefore not the egg, but just an egg, it is not a chicken egg. The chicken that hatches from it will be the first chicken, while the egg that it lays will then be the first egg. The chicken preceded the egg. So there it is. There you have it. What defines a chicken egg? Answer that, answer the question. So next time someone asks you which came first, ask them back, what do you mean by egg? Read more humor Here and more everything at The Takaho Post. Like us on Facebook. Thanks for stopping by.